The husband & I went on a mini-shopping spree on Friday. Please keep in mind that our so-called sprees involve a lot of clearance bargain shopping because we have a history of cheapness & now also have the joy of quasi-poorness. Don't feel sorry for us - our cars are paid off, we're getting close with our one credit card, our house is the only major debt so it's a chosen poorness. Anyway, the point of this post is a few of the goodies I bagged! This handsome thing is my new diaper/nappy bag from the lovely Country Road clearance. Not dirt cheap by any means but it was pushed below the $100 mark so I scooped it up. I don't think I have to tell you how smitten I am with stripes & this bag of heaven is faded, worn-in blue stripes with battered brown leather & is the perfect size for all the newborn necessities plus snacks, drinks & change of clothes for what we hope will be a potty-trained (or at least in-progress) Ben. Now I've got my eyes peeled for a decent bag insert to give this thing some shape & organizing compartments to work with. Oh heavens, look what Bonds has done. For you Americans that don't know the Bonds company, it's just the basics of clothing - undies, socks, loungie clothes for grown-ups plus adorable pj's, onesies, etc. for babies. Now they've gone & busted out a pair of penguin pants! I scooped one up for each of my little penguins - I figure it's about darn time I start branding these kids appropriately. I like how each picture is darker than the last - I'm obviously a very good photographer. Anyway, I finally hunted down a baby book that I like. I didn't realize what a chore this would be because I just bumped into Ben's at Target, loved it, scooped it up dirt cheap & just assumed that's how it happened. It ain't how it happens, folks. I've been googling for weeks trying to find one I like overseas to have shipped over after finding nothing I liked in stores around here. Striking out left & right. I didn't want one as detailed as Ben's was - just the basic birth details, place for birth announcements, hospital bracelet & list of firsts then just basically a photo album. I'd checked Target about once a week for a couple of months now then suddenly yesterday they had this one on clearance for $17. Yee-haw! Not sure how it didn't exist before & suddenly showed up on sale but I'm not one to question the universe. Yes I am. Nevermind. Best part is the brownish theme of things of hanging from a rope because that's exactly how I'm decorating Fonzie's little corner of our room - browns, beiges, neutral colors (okay, with some pops of brightness from accessories/art) & am going to have a couple of lines of twine beside his bassinet to hang artwork from instead of picture frames so they're more interchangeable, able to have more variety & less likely to fall & harm the poor boy. Score. Okay, I didn't buy this on our shopapalooza but I saw the photo online & was charmed. 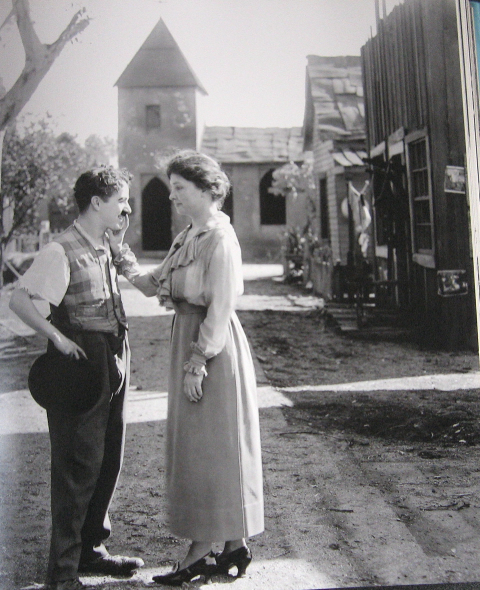 Charlie Chaplin meets Helen Keller. Maybe posting this will prove that I'm not the anti-Helen Kellerite that people once thought I was after a few passionate speeches that ran along the lines of "What's the big deal with Helen? Annie Sullivan is the one who did all the work ..." Ahhh Ashley, you & your lectures. Now I am going back to reality to deal with a child who is avoiding his nap as always, managed to finagle his diaper off from under his pj's, so still managing to make his regular mess in the bed while his other set of sheets is in the washer as we speak recovering from yesterday's leaking diaper. Surely, I have had enough urine-based annoyances for one lifetime. Any volunteers to potty train for me? Anyone? No? PS Because any chance to mention him and I will, but don't you think Robert Downey Jr did a wonderful job of Charlie Chaplin.